Thomas Chan 40 year old, Nicollet Avenue Jeweler and Art dealer in rare objects was in possession today of the Rudolph Valentino ring a 15 carat canary diamond ring was designed for the late film star. which brought about his arrest in New Orleans last March. Customs agents arrested Chan on smuggling charges, claiming he brought the rare ring, made for Valentino into this country from England. Chan paid $3,617 in penalties and $14,000 in other assessments before Uncle Sam would return the ring to him. He pleaded guilty to smuggling charges. Some months ago, when Central Casting Bureau staged a style parade to cut down its “dress extra” list and retain only the most eligible candidates, few recognized one smartly dressed blonde who stepped across the stage with the others and won, by judges verdict, the right to a place on the list. One reason so few identified her was that Jean Acker, in the days when she was screen and stage star was a brunette. But mainly was because the first Mrs. Rudolph Valentino had been in retirement, living on her income, for several years. The other day Jean Acker got the first “break” she has had in her comeback career. A Greta Garbo set was crowded with extras, ready for a big ballet scene in “Camille”. Leader of the ballet was Adrienne Matzenauer, daughter of the Operatic Prima Donna and then the word spread that Adrienne was ill. Director, George Cukor, with delay threatening a cost of thousands looked around the set and his eyes fell on a box peopled by dress extras. One of them was Jean Acker. Within an hour or so she had been rushed to “wardrobe” had done a hasty rehearsal, and they were shooting the scene. Mr. Cukor was grand to me she says and my gang they were wonderful, applauding after I’d finished. “My gang” referred to the other extras. Miss Acker is proud to be “starting again at the bottom”. Once she drew $3500 a week on the stage, after leaving films, and her salary in pictures was substantial. She retired with some $300,000 and then came 1929. “I had enough to live very conservatively, for a while” she says, “and then I had to go to work”. I didn’t want to intrude on my friends, or bother them. I had some nice clothes, so I turned to extra work. I hoped that if I was around, I would be seen. That’s better than waiting for something big to happen. “And I am happy, I have a little house, a garden, a little car, and work. I’d like to get back into bigger parts I think I could be a cross between Joan Blondell and a Genevieve Tobin, playing sophisticated but not hard characters”. But even if I keep on as I am, I’ll still be happy. I’m philosophical about things now. She can talk about her own misfortunes brightly, but she does not like to talk about Valentino. They say she is the only woman who still goes regularly to visit his tomb in the Hollywood cemetery, but she does not speak of that either, except to say that she is Irish and sentimental. Once she refused an offer of $25,000 for a story on the late great lover. She could use the money now, she says, but there still has been no authorized Valentino story with her byline. Publication sometime ago in European papers of a story from Hollywood to the effect that the former impresario of Rudolph Valentino was making a collection for the purpose of providing a worthy resting place for the film star’s ashes has produced what German newspapers call “a peculiar echo” in Hungary. It is related that the attention of the Budapest police was drawn recently in the fact that a young man calling himself a moving picture director was organizing Rudolph Valentino Clubs in various parts of the country, with an initiation fee of 10 pengos ($1.75) and annual dues of 25 pengos. The announced object of these clubs was in “cherish the memory and promote the spirit of Rudolph Valentino”. One of the club by-laws read: “The members are obligated to think of Valentino at least once a day. In go to see all Valentino films and to agitate for the showing of more of his films in the kino houses. Furthermore, on the anniversary of the death of the film star, 23 Aug, each member is to send an annual gift to Hollywood so that the urn containing Valentino’s ashes maybe decorated with flowers”. Despite the fact that pengos do not grow on bushes in Hungary. It is averred in the report that several hundred Valentino admirers mostly young girls have already paid their dues by the time the police began their investigation. In return for their money the members receive Valentino badges entitling them to participate in the annual memorial services to be conducted at the expense of the society. Answering questions by the police, the young organizer insisted that he had forwarded all his receipts to Hollywood and that he was doing this work purely out of admiration for the departed artist. As no charges were lodged against him by any of the club members, the young man was not held under arrest, but was told that he would be kept under observation until information regarding his statements could be obtained from Hollywood. In the meantime, further investigation is said to have revealed the fact that some Valentino Clubs were composed largely of believers in spiritualism and that seances’, with the shade of the film star as the chief attraction, had been on the order of the day, or night, for several weeks. One young girl told police that Valentino’s spirit made frequent visits to his Budapest admirers. This girl, the daughter of a rich industrialist, said that Valentino’s shade complained bitterly at the shortness of human memory and at the failure of his one-time enthusiasts to erect a suitable monument to him. 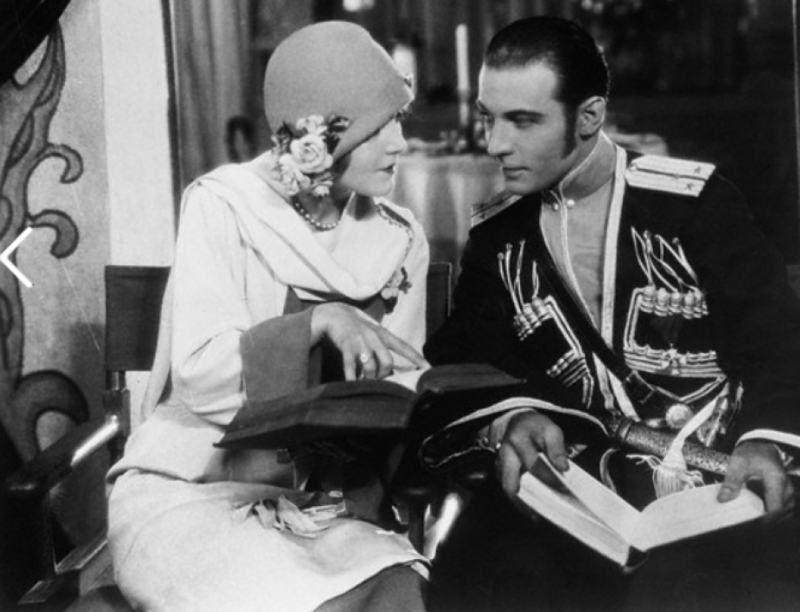 She considered it her special task to carry on a campaign with the object of calming Rudolph Valentino’s uneasy spirit.